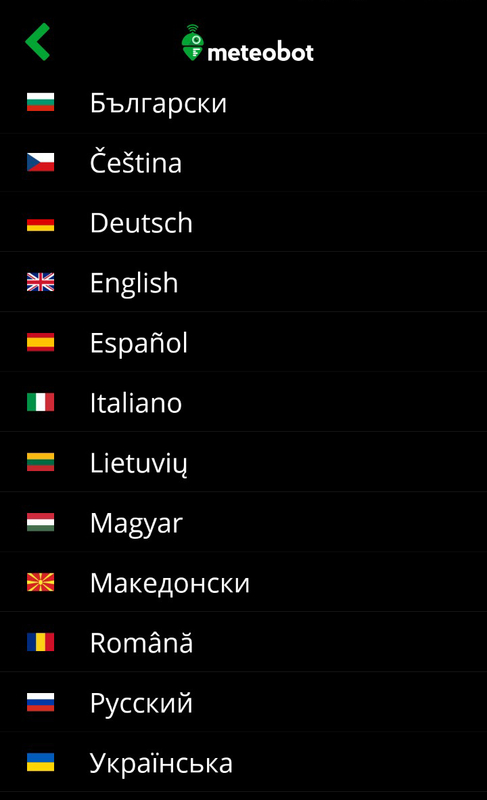 Аgronomic indicators such as rain sum, temperature sum, etc. Weather notification for frost, intensive rain, etc. Map of weather stations in Bulgaria. 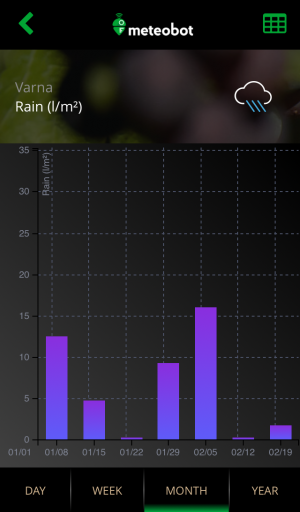 Meteobot® App provides you with information from your weather stations organized in graphs and tables. Real-time data from the meteobot. With the standard settings, Meteobot® collects data every 10 minutes and sends it hourly. You can change the settings any time and receive data more frequently – every 30 or even 10 minutes, for example. Our tests have shown that Meteobot®‘s battery can last up to 30 days without charging from the solar panel. However, frequent data transmission means greater energy consumption, which can drain the battery in the winter. 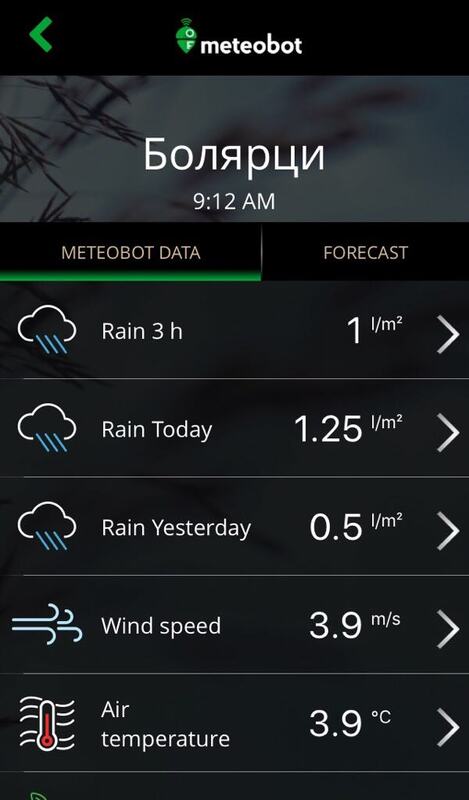 Meteobot® App securely stores all data from weather stations, for an unlimited period of time. Thus, there are no gaps or omissions – as compared to manual records keeping on paper. Historical data – one month ago. For your convenience, we have combined the weather forecast and current data from the weather stations in one graph. This way, for example, you can see how much rain has fallen up to the current moment and how much more is expected. 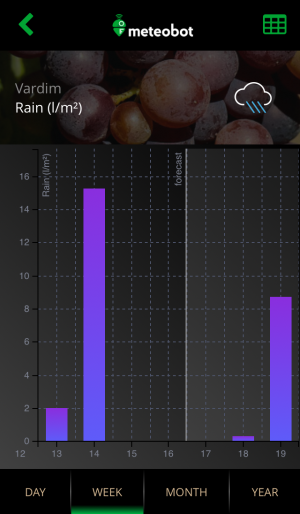 Forecast and reported data about the fallen rain. The weather forecast is for 10 days ahead. For the first two days, data is provided on an hourly basis, and from day 3 to day 10 – in 6 hours’ periods. The forecast is global. Its spatial accuracy is 8 km. The forecast is generated by the European Center for Medium-Range Weather Forecasts, whose weather model was named one of the most precise in the world. Because Meteobot® is specialized for farming, it keeps weather stations data in your fields’ history. 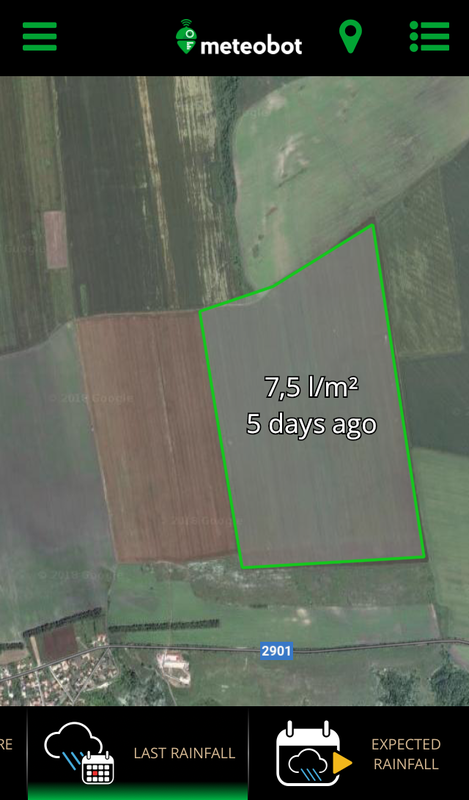 The only thing you need to do is to outline the boundaries of your fields on the map. Once you have done it, you get a complete agro-meteorological history from the moment a weather station was installed nearby. 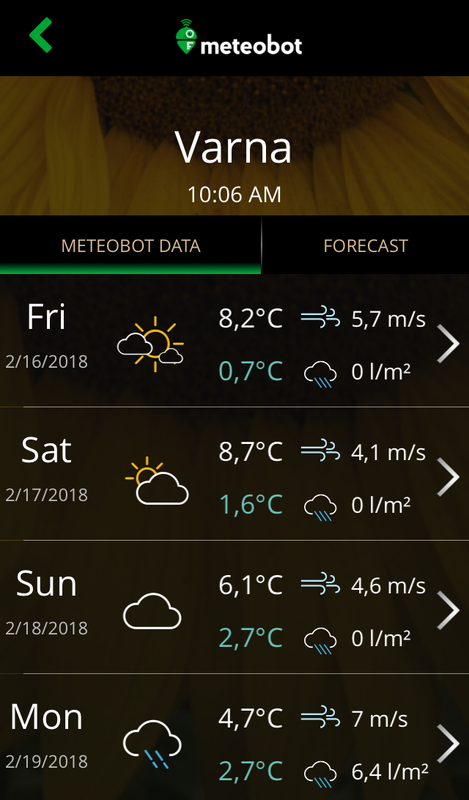 The main advantage of Meteobot® is that you receive data from your own weather station (or from another one nearby), and not from a weather device miles away from your land. 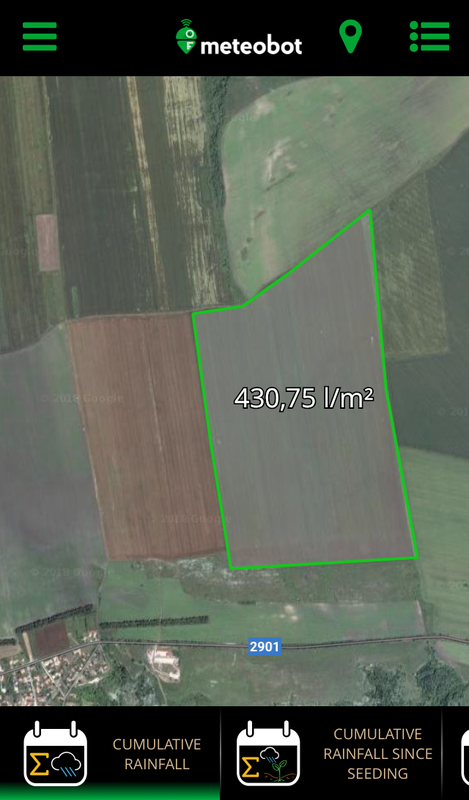 Outlined field and its characteristics. 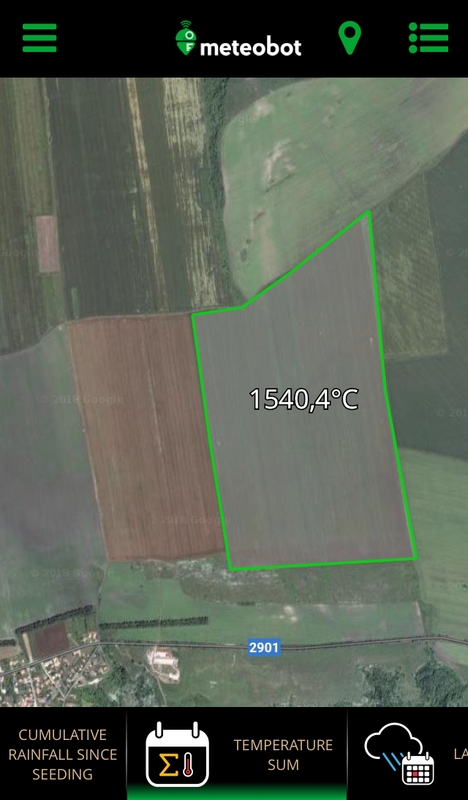 The data for each field is taken from the nearest Meteobot®. 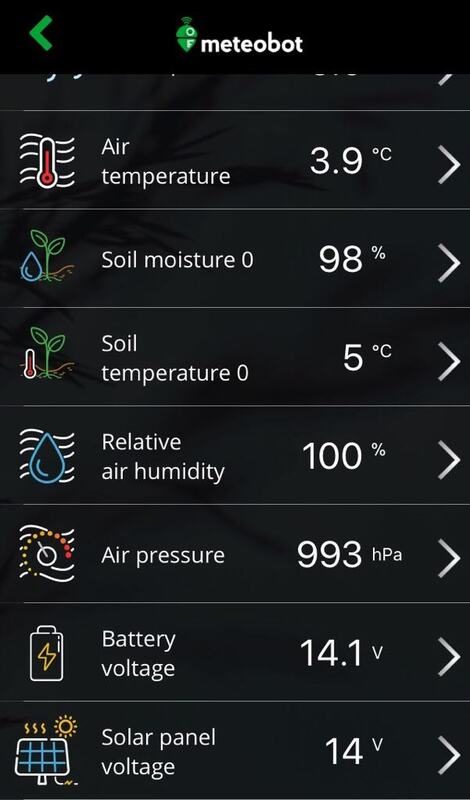 If, later, you install or subscribe for a weather station closer to your field, the system automatically starts to collect and store data for this field from the new device.